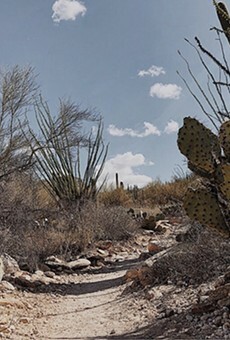 Sabino Canyon is not only a favorite of longtime Tucson hikers; it's a great "gateway drug" for those just discovering the addictively healthy pleasure of Tucson hiking. A visitors' center provides some excellent resources to start with. There is an entrance fee, but there's ample parking and restrooms available. Sabino Canyon can be hiked, biked or jogged—or even explored on a guided tram tour. The main road is paved, making the hike suitable for children and easy on bikes. There are also consistently impressive views of desert scenery and wildlife. Hey, if you get addicted to Tucson hiking, beyond the main road, many other trailheads start at Sabino, including one to Bear Canyon.